Over the last decade proliferation of music making tools that are available to the widest demographics has been significantly changing the landscape of the recording industry. Every smart phone or tablet comes with numerous free applications that allow virtually anyone with no musical training to create quite interesting music. In order to make these applications commercially viable, software manufacturers had to design their tools by primarily manipulating the rhythmic structure of the music rather than the melodic structure. This shift from melody to rhythm has become evident in many popular musical styles. Now, quite understandably, it has gotten to the Hollywood film music as well. A musical theme in many Hollywood films is no longer a melody composed of notes. Instead, it is a feeling, a groove, a rhythm, which is related to the fact of wanting to appeal to a “younger” demographic. This audience would probably rather enjoy a groove than be “bothered” by a pesky melody. For that reason, the film audiences consider melodies to be old fashioned and dated, stale and a product of a bygone age. There is a perception that if a film score contains any memorable leit motive melody it will detract from the drama and come off as sounding like something from the old days. Perhaps the lack of strong melody in modern film scoring leaves us with an easy musical tool to exploit. It’s great to be puttering along in a cue that perhaps is a simple beat based groovy ostinato, and suddenly intensify the drama and surprise the audience with a melodic idea. I will show by concrete examples of presenting several film clips, how this change took place over the years, and how this new trend in film scoring has been established. Mladen Milicevic received a B.A. (1982) and an M.A. (1986) in music composition and multimedia arts studying at The Music Academy of Sarajevo, in his native Bosnia and Herzegovina. In 1986 Mr. Milicevic came to the United States to study with Alvin Lucier at Wesleyan University in Connecticut, from which he received his masters in experimental music composition (1988). From the University of Miami in Florida, Mr. Milicevic received his doctorate in music composition in 1991, studying with Dennis Kam. For several summers he also studied with Michael Czajkowski at the Aspen Music School. He was awarded several music prizes for his compositions in the former Yugoslavia as well as in Europe. Working in former Yugoslavia as a freelance composer for ten years, he composed for theater, films, radio and television, also receiving several prizes for this body of work. Since he moved to the United States in 1986, Mr. Milicevic has performed his live electronic music, composed for modern dances, made several experimental animated films and videos, set up installations and video sculptures, had exhibitions of his paintings, and scored for films. His interests are interdisciplinary and he has made numerous presentations at various international conferences on a wide range of topics such as music, film, aesthetics, semiology, sociology, education, artificial intelligence, religion, and cultural studies. Bizarrely enough, he has scored film “The Room” which is now become an international phenomenon as the worst film ever made. 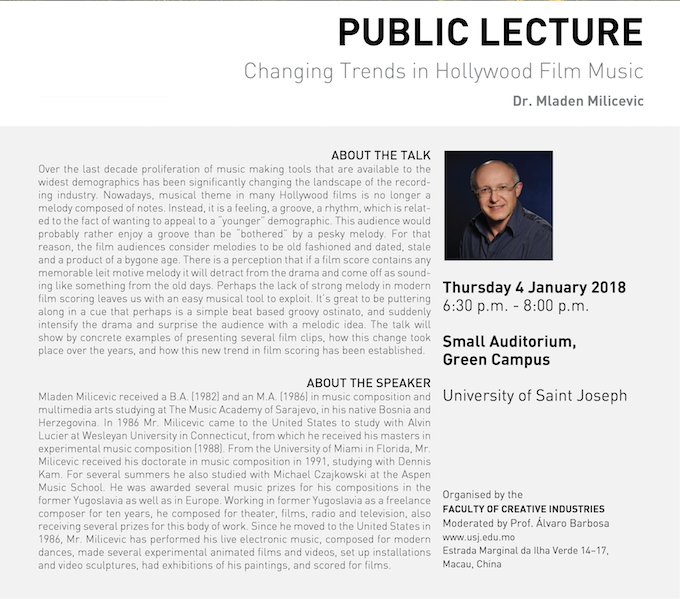 Mr. Milicevic is Professor and Chair of Recording Arts Department at Loyola Marymount University, Los Angeles.